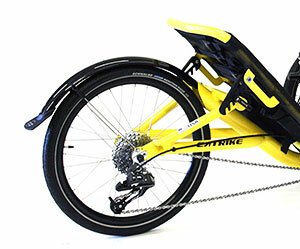 The Catrike Trail and Villager are now siblings and share similar components and price point. The New Villager is the same great Catrike with a higher seat and wide track. The New Trail is now a seriously fun sport model with a longer wheel base. They both have a triangulated second generation space-frame with an adjustable seat back. 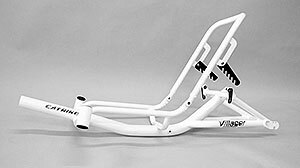 We have put a lot of work into this project and are very satisfied with these new lightweight frames. The second generation space frame reaches the same high benchmark of performance set by our original space frame and are now adjustable by popular request! The Villager's seat back can be adjusted from 35 degrees to 55 degrees, and the Trail's seat back can be adjusted from 39 degrees to 53 degrees. Continuing our tradition of using top quality parts from great component manufacturers, we have lifted the standard specification on the Villager and Trail to include components such as SRAM X7 gear. We even took our attention to detail into our new adjustable seat backs. All pivots on our new Catrikes have Norglide Bearings that are self-lubricating, minimal friction, maintenance-free and will last a lifetime. There are no threaded bolts that interface with aluminum to wear your frame out. The adjustable brackets that connect the seat frame to space-frame attach to a press fit bronze bushing with a shoulder to allow quick adjustment of seat angle.